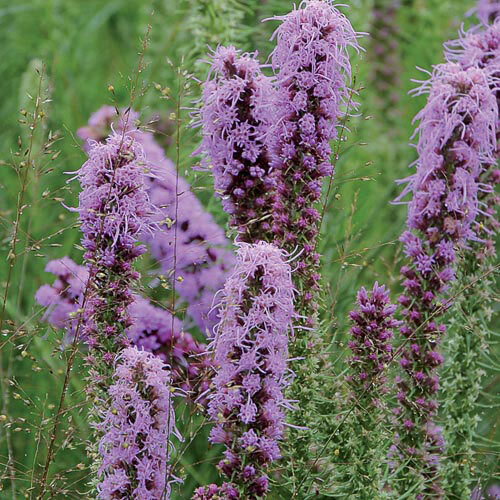 (Liatris pycnostachya) One of the most spectacular and majestic of the prairie plants. Large spikes of tightly bunched magenta flowers bloom from the top to the bottom of the stalk. An excellent cut or dried flower. Grows 3-4' tall. Perennial. Hardy to zone 4. Instructions - Germination is increased by a 30- day cold treatment in slightly damp paper towels in a plastic bag in the refrigerator. Seed can also be directly sown into a prepared seedbed in fall, or in early- to mid-spring. Requires a rich loam, clay, or slightly moist sandy soil.